At the end of the nineteenth century, serial murderer Joseph Vacher, known and feared as “The Killer of Shepherds,” terrorized the French countryside. He eluded authorities for years—until he ran up against prosecutor Emile Fourquet and Dr. Alexandre Lacassagne, the era’s most renowned criminologist. The two men—intelligent, bold, and full of the spirit of the age—typified the Belle Epoque, a period of scientific achievement and fascination with its promise to reveal the secrets of the human condition. With high drama and stunning detail, Douglas Starr recounts Vacher’s infamous crime wave, interweaving the story of how Lacassagne and his colleagues were developing forensics as we know it. We see one of the earliest uses of criminal profiling, as Fourquet painstakingly collects eyewitness accounts and constructs a map of Vacher’s crimes. We follow the chilling and horrific events leading to the murderer’s arrest. And we witness the twists and turns of the crucial trial, celebrated in its day. In an attempt to disprove Vacher’s defense by reason of insanity, Fourquet recruits Lacassagne, who in the decades previous had revolutionized criminal science by refining the use of blood spatter evidence, systematizing the autopsy and doing ground-breaking research in psychology. Lacassagne’s efforts lead to a gripping courtroom denouement. 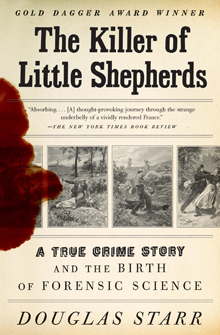 The Killer of Little Shepherds is an important contribution to the history of science and criminal justice, impressively researched and thrillingly told.